Today we welcome a post by Zohra Saulat as part of our collaboration with Hack Library School. Zohra Saulat is a second-year MLIS student and graduate assistant at the University of Illinois Urbana-Champaign. She plans on becoming an instructional and reference librarian. Through librarianship, she hopes to do her part in making information accessible. She likes cats, chai, and cardigans, as well as alliteration. She tweets occasionally @zohrasaulat. From MySpace and Facebook to Twitter, Instagram, and Snapchat, social media is one the most radical developments in the past fifteen years, altering the way we do things and think about things. Information is everywhere. News is not just available through print newspapers, nor through the publisher’s website, but is disseminated via social media. Thus, discussions are no longer confined to a room, nor limited to face-to-face interactions, but conversations now also occur in digital space. We can share our ideas with others across the world. We are connected now more than ever. The way we communicate, present ourselves, and take in information has expanded thanks to social media. Whether an individual or an institution, having an online presence is necessary to stay connected in today’s world. Many businesses and organizations have strategically increased their reach to target audiences through various social media platforms. Libraries, too, have been using social media to market their services and resources. Much has been written about how libraries can effectively utilize social media, but there is little literature on another fascinating trend: how librarians use personal social media accounts for professional development and networking. Each social media platform has been designed for a unique purpose. LinkedIn is considered the typical platform used by a myriad professionals for networking. Librarians, ever the innovative bunch, are taking advantage of another platform to connect with each other professionally. Twitter, in particular, allows for librarians to easily discover other librarians and engage in both professional and personal discussion. Twitter was essentially created to quickly share bits of thoughts and information. A bit like a diary entry, a bit like the Facebook status and a bit like the comments section of an online newspaper, Twitter has naturally emerged as an alternative space to broadcast thoughts and have conversation regarding any and everything from politics, to pop culture, or the personal. Librarians can find each other using hashtags (#library #librarians etc.). Twitter also offers suggestions on who users might be interested in following based on what they tweet or who they follow. 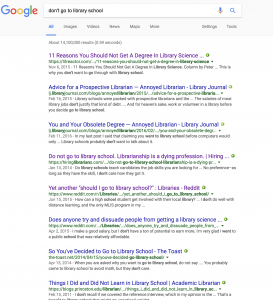 Librarians may promote job postings and other professional opportunities. I’ve seen librarians actively seek out hotel roommates or organize meet-ups for conference trips. Often during LIS conferences, librarians at the conference as well as those who are not attending can follow the dialogue via a hashtag. Organized Twitter chats also take place. #Critlib, short for “critical librarianship” hosts bi-monthly Twitter chats on specific topics within librarianship. Hack Library School also hosted a Twitter chat earlier this year. Our profession is known for being progressive and socially conscious. Being able to discuss important topics and connect with librarians across the country, and around the globe, can potentially bring forth recognition and solutions to the issues we care about as a profession. Additionally, all of this fosters a supportive and inclusive professional support system outside of work. However, there are a few drawbacks we should be cognizant of when identifying ourselves professionally on a personal and public account. Even though for the most part I have seen excellent use of social media amongst LIS professionals in managing the line between professional and personal, I have come across a few questionable, and even shocking, instances on Twitter. As a general rule of thumb, one should refrain from posting work gossip or any sort of “dirty laundry.” This etiquette may seem to be common sense, but I feel it is worth reiterating: if you are identifying yourself as a professional on a public account, even if it is a personal account, you should act professionally. As someone who grew up using social media, I recognize that folks of my generation do have a tendency to overshare on social media. When discussing this issue with a few of my colleagues, some shared that they make a conscious decision to filter what they post: nothing too partisan, nothing too negative or whine-y. This may not be ideal to some, but the reality is that there can be consequences. Employers do look through social media accounts of prospective employees. I have even heard of an instance or two where seemingly qualified candidates were not offered interviews because they did not seem to be an “institutional fit.” Before even getting a chance to speak with the hiring committee, these candidates were eliminated based on an impression. This may be problematic or unfair, but it is the reality: Whether the impression is based off a few tweets or minimal interaction through in-person professional collaboration, it is similar. Social media is an extension of ourselves. The way we post on social media undoubtedly imparts an impression to whoever sees it, whether an employer or an acquaintance. From our default picture, to our header image, our bio; however we chose to represent ourselves on social media may not necessarily be the full picture of who we are and can unfortunately be taken out of context. This is not to say we cannot be political or voice our opinions, we just need to be conscious of how we represent ourselves and our place of employment. Many librarians issue a disclaimer in their Twitter bio that their tweets do not represent their employer. It can be easy to rant on social media. If you find yourself needing to vent about work or the job hunt that is perfectly acceptable, just don’t do it on public social media accounts where it can come back to bite you. If anything, you want to make yourself look good (i.e. employable) on social media; so take advantage of these platforms to highlight your achievements. Ultimately, as the name implies, as information professionals, we should be professional and be able to expertly manage information, including our own. Though not exactly created for networking, Twitter has proven a great tool for professional development, especially for librarians. This post is merely intended to be exploratory. It will be interesting to see studies on how librarians can effectively use Twitter for professional development. However by then, I am sure there will be another tool or technology that librarians will be taking over. Many thanks to ACRLog and Hack Library School for this opportunity. Today we welcome a post by Ian Harmon as part of our collaboration with Hack Library School . Ian Harmon is an MSLIS student at the University of Illinois at Urbana-Champaign and a Graduate Assistant in the Scholarly Commons, the University Library’s digital scholarship center. Prior to entering library school, he earned a PhD in Philosophy at Illinois and taught philosophy at Rice University. Ian is interested in digital humanities and scholarly communication, specifically the ways in which technology impacts research and the dissemination of scholarship. He enjoys teaching, and hopes to work in an academic setting that will allow him to work directly with students and other researchers. Ian is also passionate about the role that libraries serve as central institutions of the public sphere and supporters of the common good. The easy way to describe my pursuit of a career in academic librarianship would be as a Plan B. Nevertheless, I avoid describing it as such because the expression suggests that it’s my second choice, or that I’m settling for something less. This couldn’t be further from the truth. 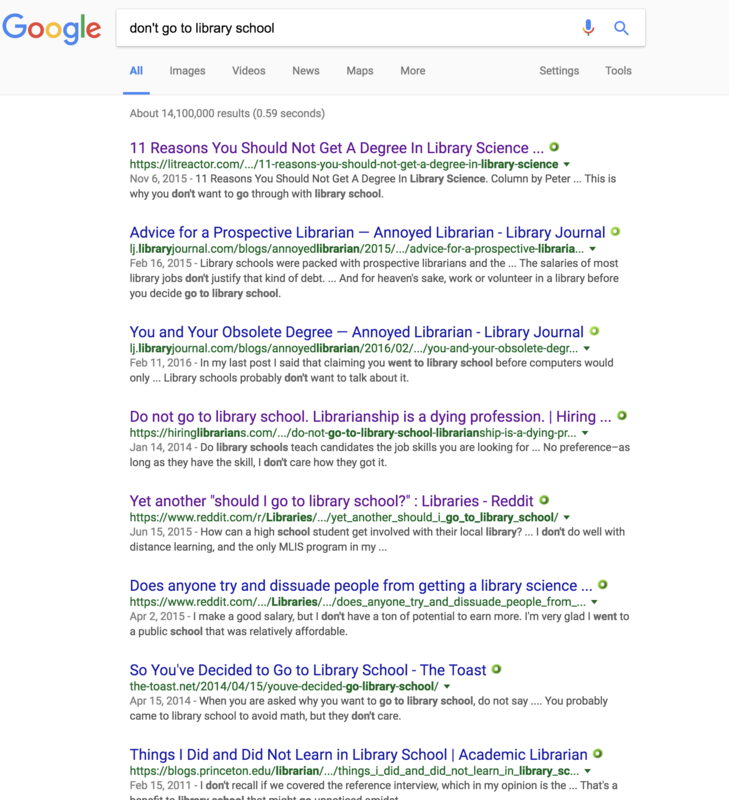 As I begin the second year of my LIS program, I’m more confident that I’m on the right path than I ever was while following my “Plan A.” And when I find myself thinking that I should have considered a career in libraries earlier on, I remind myself that, had I not taken my long path to librarianship, I might never have gotten on the path at all. My Plan A was to be a philosophy professor. I became a philosophy major my sophomore year of college, after having taken a couple of electives in the field during my freshman year. As a 20 year old, I wasn’t concerned with things like making money, finding a job, or learning “practical skills.” Rather, I was interested in doing something I enjoyed, and I assumed that everything else would take care of itself. But even though I was a philosophy major for the majority of my college career, I never really thought about what I was going to do after graduation. By the time I was a senior, I supposed that I should probably go to graduate school (what else was I going to do with a philosophy degree? ), and then become a professor. I didn’t have a clue what I was doing as I applied to grad school, but I was fortunate enough to wind up at a strong MA program at the University of Wyoming. There, I really began to learn about philosophy the profession, as opposed to the field of study. While I wouldn’t admit it at the time, the more I learned about the philosophy profession, the less sure I felt that I was pursuing a path that would lead me to a career that I would enjoy. The warnings about the competitive nature of the field had been too abstract for me to take seriously as an undergrad. But things became more concrete during my Master’s, as I applied to PhD programs and received rejection after rejection. Looking back, it stands out that I never once considered exploring other careers. I felt too far invested in philosophy to make a change, and the thought of doing so seemed like it would be an admission of failure. So I pushed on, completed my thesis and was eventually accepted to the PhD program at the University of Illinois at Urbana-Champaign (where I am now an MSLIS student). It felt like I had made it past an important milestone, but this would only serve to foster the development of some major imposter syndrome as I began my new program. My insecurities aside, I continued to do well, and started to think that maybe I was doing the right thing after all. Moreover, I started thinking I would be one of the fortunate few who would actually get a tenure-track job after graduation. Despite my success within the PhD program, the job market proved to be the nightmare that had always been promised to me. But as fate would have it, I was able to put off considerations of an alternative to philosophy for a bit longer, as in April of my final year I was offered a one year position in the Philosophy Department at Rice University. No, it wasn’t a tenure track job, but surely, I thought, it would serve as a great springboard for more permanent opportunities. I enjoyed my time at Rice, but I began to feel a sense of isolation that I hadn’t encountered as a graduate student. Outside of my teaching duties, most of my work hours were spent alone in my office, or surrounded by strangers at a coffee shop. These experiences helped me to discover that what I enjoyed the most about academia was interacting with other people, whether through teaching or conversing with colleagues or fellow grad students. Meanwhile I wasn’t having any luck on the tenure-track job market, and early in the Spring semester of my year in Houston I decided it was time to make a change. I started exploring alternative careers, but initially, I just needed some way to pay the bills. Unfortunately, nothing really jumped out at me. Libraries finally entered the picture when my aunt, a public librarian, suggested that I consider pursuing an MSLIS. The idea of working at a library appealed to me, but I was hesitant to go back to school, having spent less than a year of my adult life as a non-student. But my aunt had planted the seed of an idea in my head that would continue to grow. After finishing the year at Rice, I moved back to Champaign, Illinois, where I had a support network of friends (and a fiancee who is now my wife), and began looking for work. I spent the summer as a meat clerk at a grocery store, when my mom mentioned a position she’d seen at the University Library that she thought I should apply for. This would prove to be the break I needed, as I was fortunate enough to land the job and become the Office Manager of the Scholarly Commons, the U of I Library’s digital scholarship center. Needless to say, I loved the job. I loved the collegiality throughout the library and the collaborative nature of the work. I loved the fact that I was learning new things everyday, and most importantly, that the main purpose of my job was to help other people. Long story short, I’m finally on the career path that’s right for me. I have to admit that, at times, it feels like I wasted a lot of time during my short lived philosophy career. But ultimately, I have no regrets. I won’t be a philosophy professor, and that’s okay because I don’t want to be a philosophy professor. Contrary to what someone once told me, if I was offered such a job, I wouldn’t take it, because that’s not my Plan A. Academic librarianship is my Plan A. It’s not what I thought my Plan A was for a long time, and it’s a lengthier plan that I realized. But it’s mine, and I stand by it.